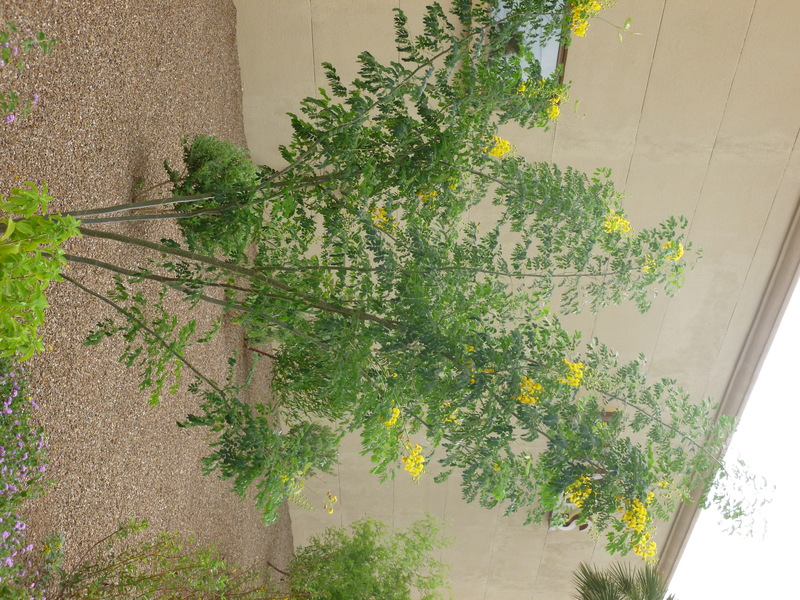 What is the small tree with yellow flowers and round leaves in Arizona? 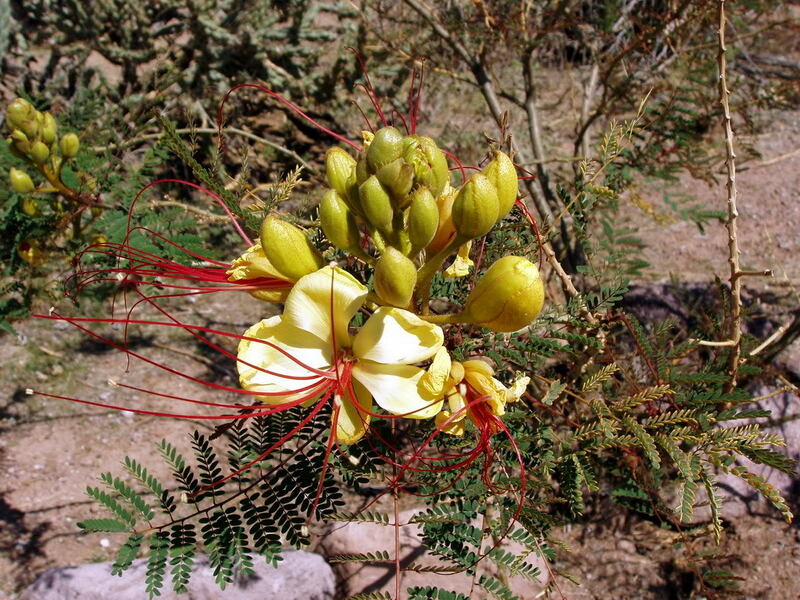 The Caesalpinia mexicana, Mexican Bird of Paradise, is a flowering plant species in the pea family, Fabaceae. 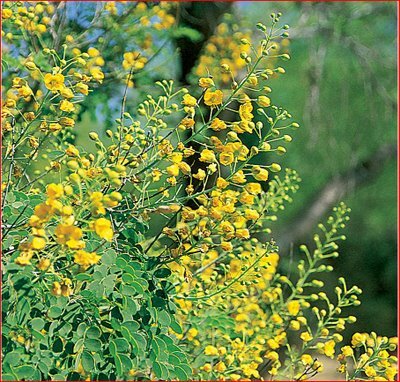 This drought tolerant, perennial tree is native to Mexico and the extreme lower Rio Grande Valley in Texas. All parts of this Mexican plant are poisonous. 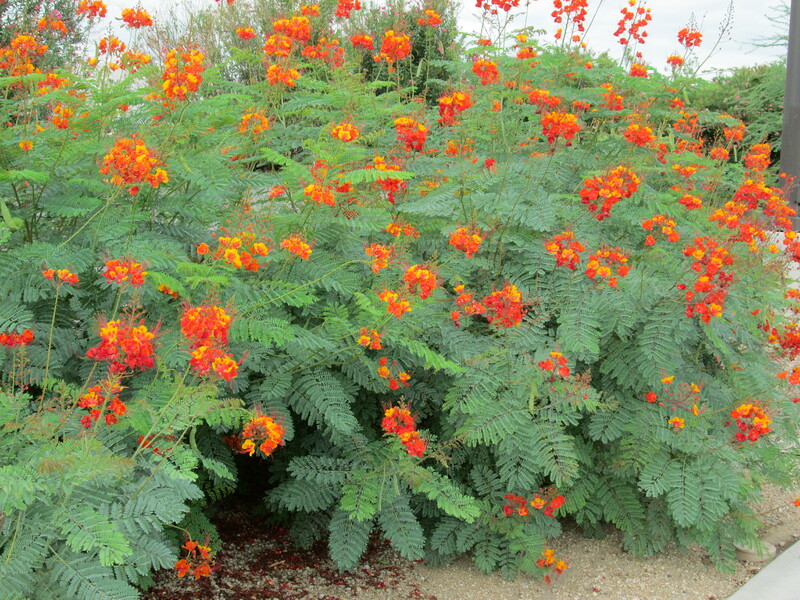 The showy Mexican Bird of Paradise shrub thrives in dry conditions. Once the roots are established, they are drought tolerant. If you are looking for a small shade tree that is flowering and easy to care for; the Mexican Bird of Paradise is perfect for your yard and a good choice for xeriscape desert gardens. Caesalpinia mexicana, Mexican Poinciana, does best in full sun. It is a perennial flowering tree that is heat resistant; with rounded leaves and spikes of solid yellow flower clusters. The fragrant yellow flowers of this Bird of Paradise are very showy and will bloom throughout the year! The USDA Hardiness Zone is 9. 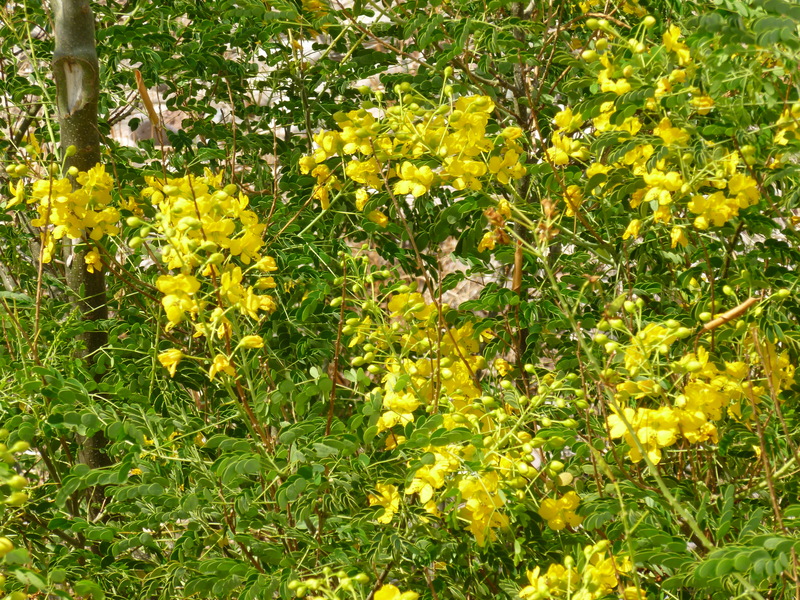 In the photo ABOVE see the rounded shape of the leaves and the yellow flowers. The “Red Bird of Paradise”, – commonly but mistakenly called (The Mexican Bird of Paradise), – has Red, Orange and Yellow Flowers. See the Picture below. The Mexican Bird of Paradise bush can be pruned and trained into a small tree. Germinating the seeds for this Mexican Bird of Paradise will be easy! Simply soak the seeds from the bean pods in water for 48 hours or like many people use a damp paper towel. If you are using the paper towel method to germinate your seeds-when a white shoot appears-plant it with the white shoot facing DOWN. To plant and grow your bird of paradise — plant the seed in peat pots. 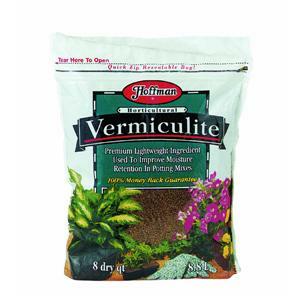 Cover the seeds lightly with damp vermiculite or your choice of a good soil. Bird of Paradise seeds need at least 8 hours of sun, but not direct sun it will be too hot! You can start to give them a little more direct sun after the first leaves appear. 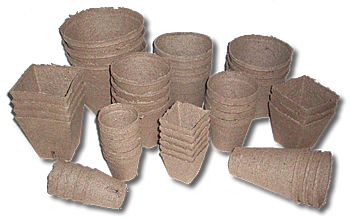 Peat Pots are great and make growing and transplanting your Mexican, Yellow or Red Bird of Paradise seedlings much easier. Start your seeds indoors and when you are ready to plant your Bird of Paradise just put the entire pot in the ground. Roots will penetrate the peat pot and the pot disintegrates enriching the soil. 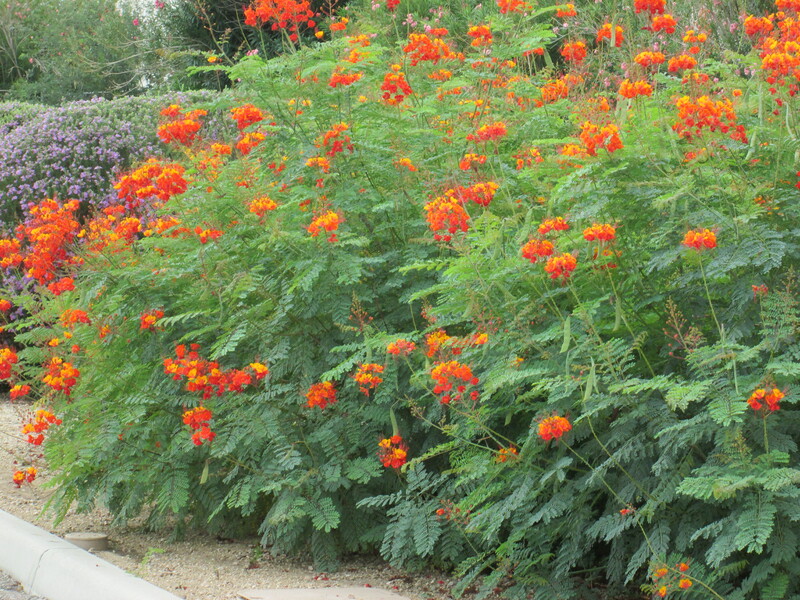 Arizona’s well-known desert bird of paradise shrubs burgeon with vivid red flowers or delightful yellow blooms. 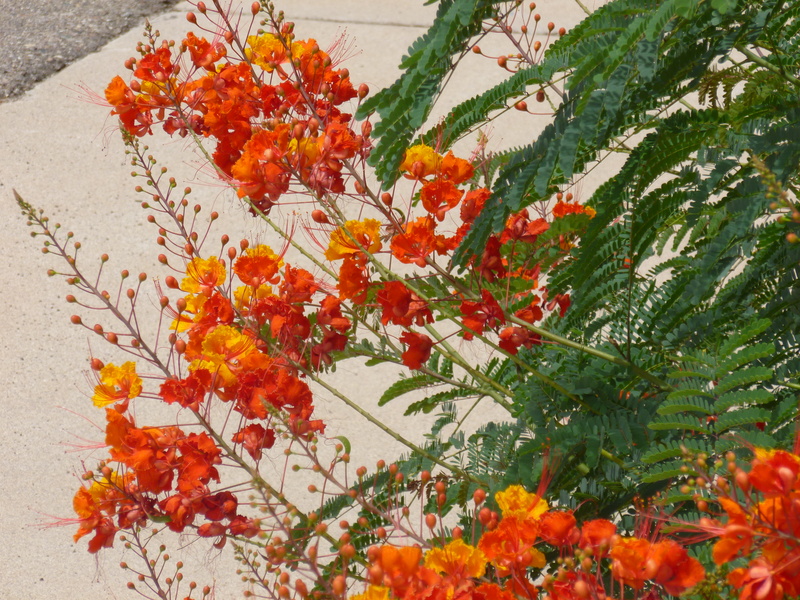 The red bird of paradise, Caesalpinia Pulcherrima, is our favorite and we have several constituting a border. This Red Bird of Paradise is a drought and heat tolerant shrub that relishes full sun with its lively red- orange flowers cultivating out of long, thin stalks. Looking for detailed information on the Mexican Bird of Paradise pictured below? More details for the Yellow Bird of Paradise shrub pictured below. Peat Pots are great and make growing and transplanting your Desert Bird of Paradise seedlings easy. 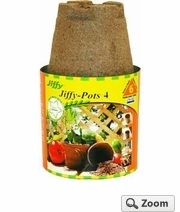 Start your seeds indoors and when you are ready to plant simply put the entire pot in the ground. Roots will penetrate the peat pot and the pot disintegrates enriching the soil. To germinate Bird of Paradise seeds, soak the seeds from the bean pods (pods need to be brown) in water for 48-72 hours. Next plant them in peat pots, barely cover the seeds. You may prefer to use the paper towel method to germinate your seeds; if so, when a white shoot (root) appears, plant it with the white root DOWN. Cover the seeds lightly with damp soil. Bird of Paradise seeds need at least 8 hours of sun, but not direct sun; it will be too hot! You can start to give them a little more direct sun after the first leaves appear. These resilient desert bushes THRIVE in intense heat and look stunning with cactus, succulents, Lantana, even Bougainvillea! Many have asked – Is the Red Bird of Paradise plant toxic? All 3 of the bird of paradise flowering bushes are poisonous. 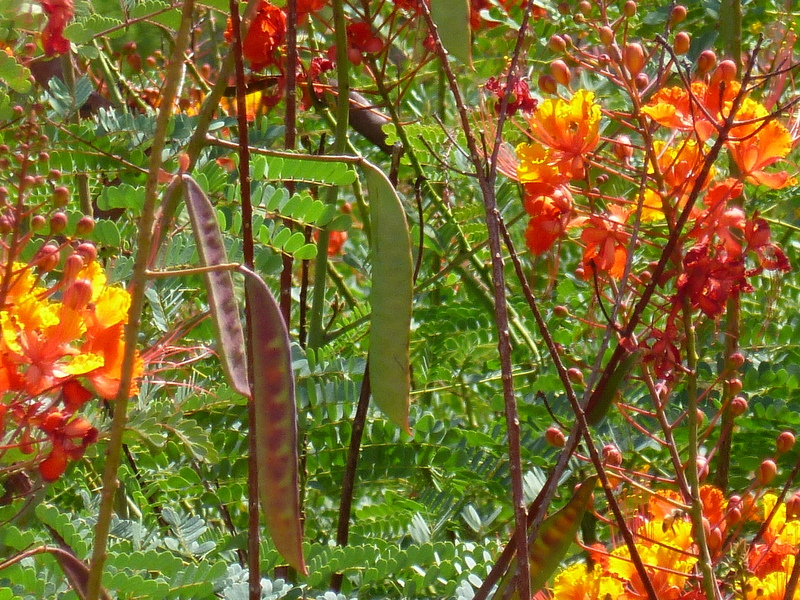 The orange and yellow flowers of the Caesalpinia pulcherrima, make a stunning bush. 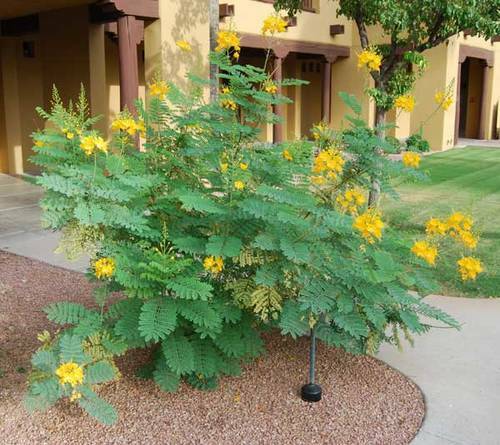 The true Mexican Bird of Paradise tree has yellow flowers and round leaves. The Yellow Bird of paradise plant has clusters of yellow flowers with a long red stamen. All of these beautiful desert bushes belong to the genus Caesalpinia. But DO NOT eat any part of the 3 Bird of Paradise plants. 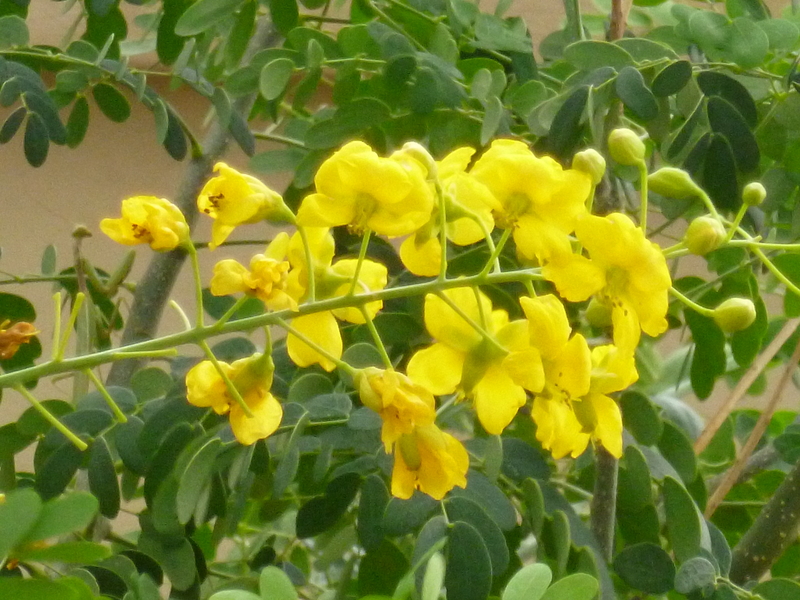 Caesalpinia is a genus of flowering plants in the legume family, FABACEAE. The fruit of these Bird of Paradise desert bushes is a long, flat seed pod. The seed pods are toxic! Watch small children and pets around these shrubs. The level of toxicity for the bird of paradise plants is low. The leaves contain hydrocyanic acid. The toxins in the bean pods are tannins. The role of tannins in many species of plants is to protect it from predators. Ingesting any part of bird of paradise plants can cause gastrointestinal irritation. Nausea, diarrhea and vomiting are symptoms of bird of paradise poisoning. While the Red, Yellow and Mexican Bird of Paradise’s toxins are not life-threatening; keep in mind that diarrhea and vomiting can produce dehydration. These symptoms should be taken seriously and you should seek medical treatment. The flowers on the Red, Yellow and Mexican Bird of Paradise bushes are thriving in the sweltering heat. Vivid energetic colors of this drought tolerant shrub are sure to catch the eye of any passer-by. This is one of our favorite desert shrubs we recommend to people who want flowering plants that are perennial (you need to plant them only once), hardy, low care, and drought resistant. With an abundance of fern-like leaves these delightful shrubs can add a tropical perspective to any desert landscape! 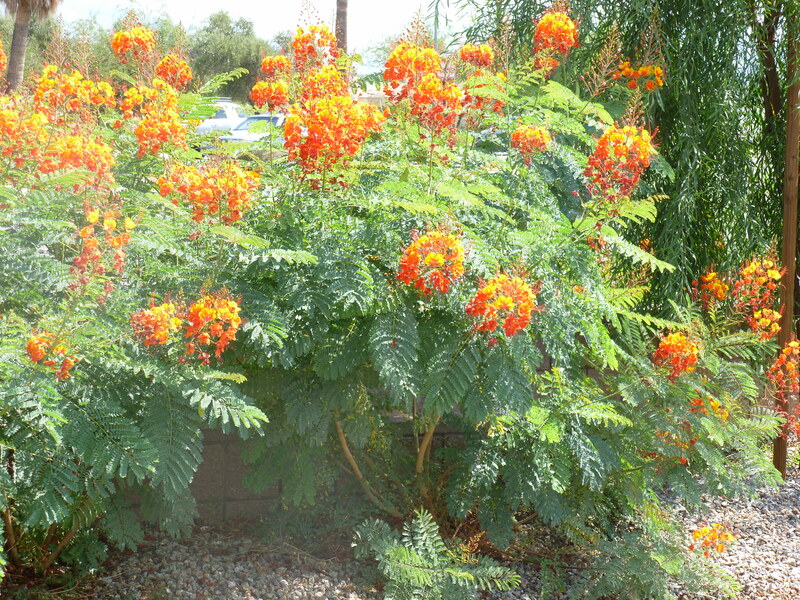 Pruning your Red Bird of Paradise, Caesalpinia pulcherrima , should be in late winter or early spring. Use a sharp pair of garden shears. Our Bird of Paradise bushes are pruned about 16 inches from ground level. 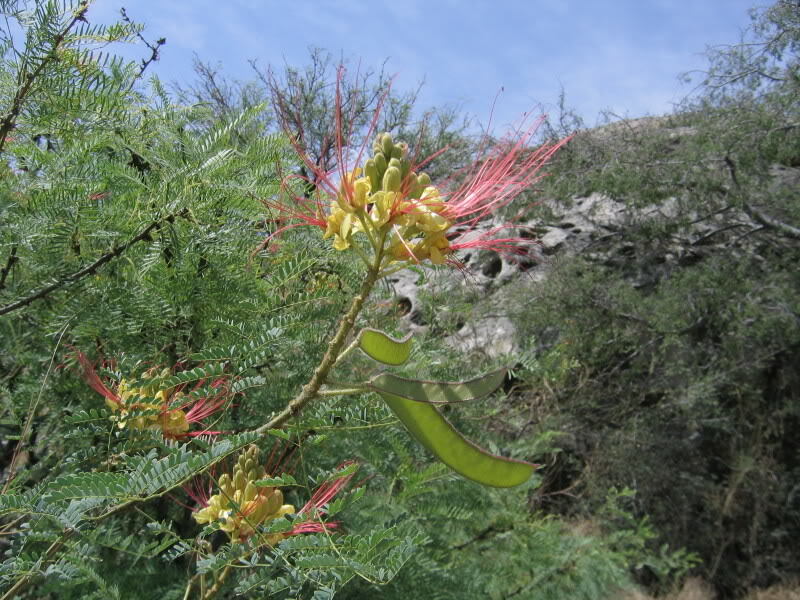 Caesalpinia gilliesii, Yellow Bird of Paradise or sometimes called “Desert Bird of Paradise” is a shrub that has been naturalized in Texas. The signature long red stamens adorn the clusters of charming yellow flowers. 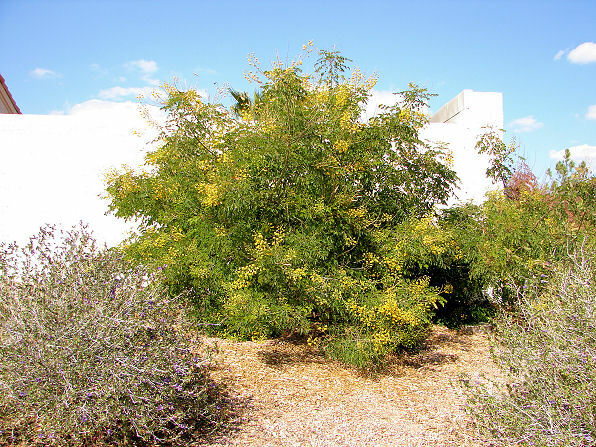 Originally from Argentina, this Yellow Bird of Paradise upright shrub is very fast growing. This long-lived, drought tolerant plant is very durable along with cold and heat tolerant. Exposure to full sun is best! All parts of the bird of paradise plants are toxic. Yellow Bird of Paradise can grow to the height of 10 ft.
Plant your Bird of Paradise in full sun locations. These bushes do fine in any well-drained soil including rocky, native soils. In the Spring, prune to remove dead or damaged stems. In the summer water your Yellow Bird of Paradise every week. Water it deeply to stimulate a long taproot. Once established the Yellow Bird of Paradise will need less water. These desert favorites are easy to find, inexpensive, and provide exciting color over and over throughout the year. 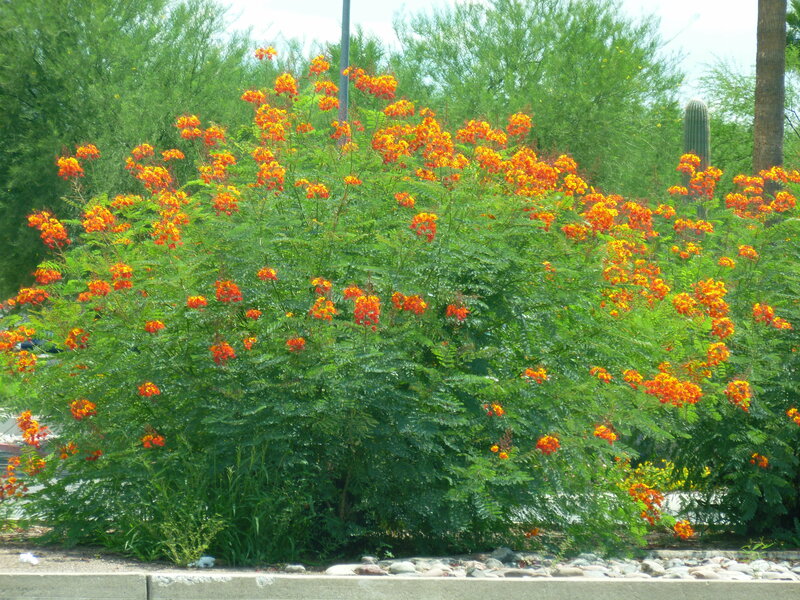 All Bird of Paradise plants are winners for your Arizona or desert landscape! The Red Bird of Paradise is a fast grower, and will get large! It is hardy and does well in any soil; but, the better drainage you have the healthier the plant will be. Bird of Paradise plants look bare during the winter but they always come back strong and healthy! The seeds and bean pods are poisonous so be careful your children and pets don’t eat them. Red Bird of Paradise is very hardy and drought tolerant once the taproot is established. With a little mulch at the base, they come back year after year. 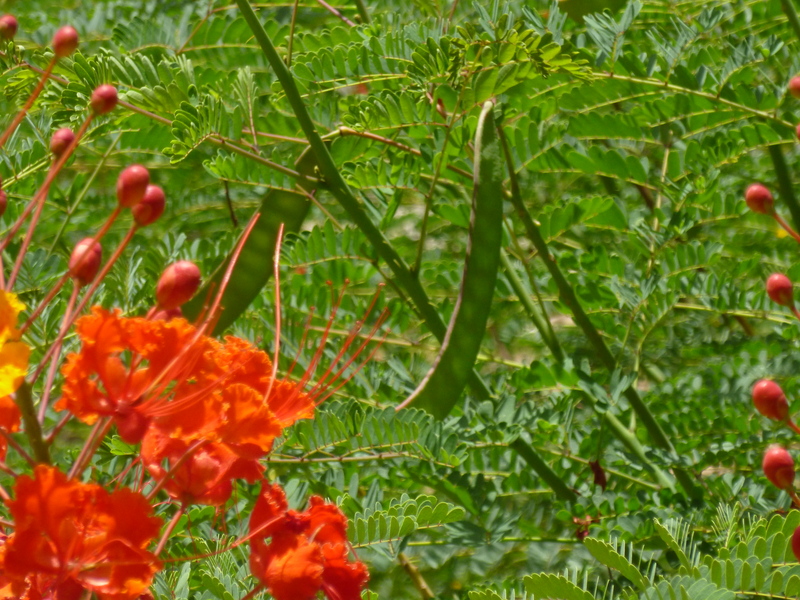 Many people refer to this red and orange desert bush as the Mexican Bird of Paradise (Caesalpinia mexicana). The actual Mexican Bird of Paradise has all yellow flowers and is larger. 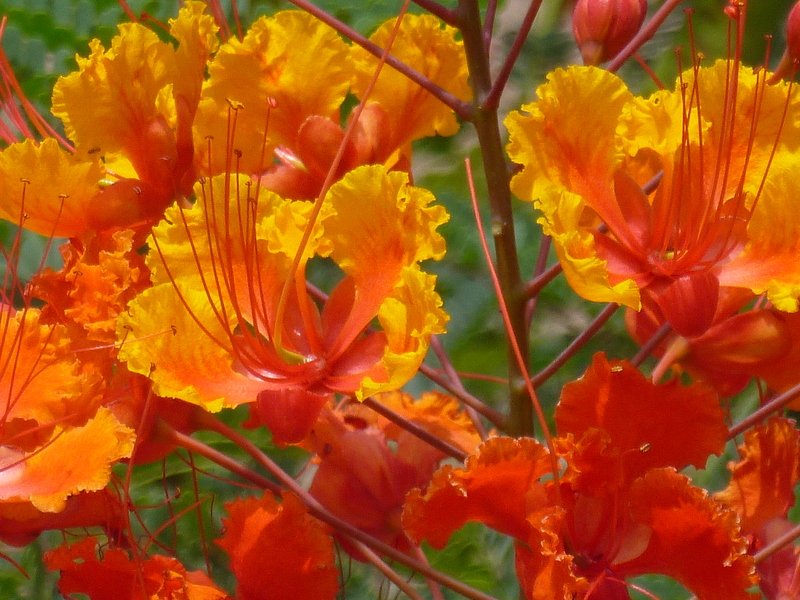 Being native to Mexico, Caesalpinia Mexicana is the real Mexican Bird of Paradise. It is larger with ROUND leaves and can be pruned into a small tree. Using bean pods to grow your bird of paradise plants is uncomplicated and well worth the effort. 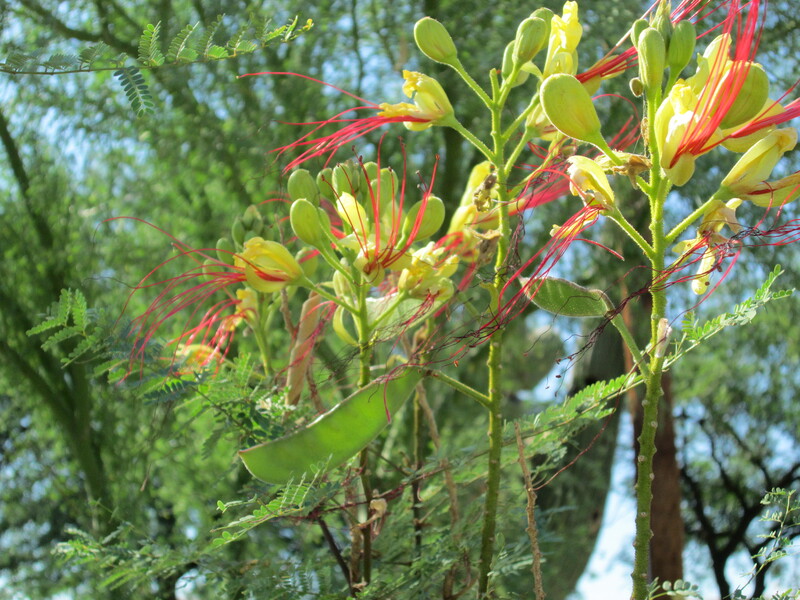 Caesalpinia pulcherrima, Red Bird of Paradise, is a species of flowering plant in the Fabaceae, pea family. 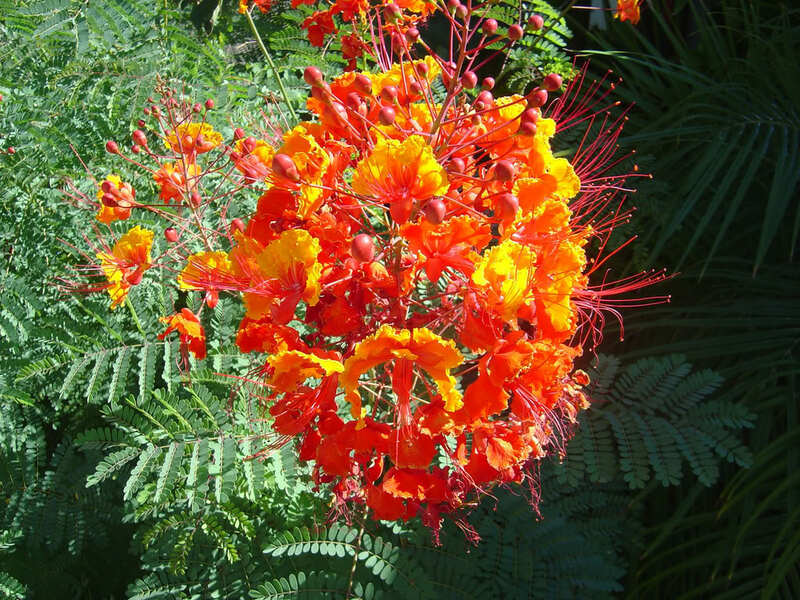 Other common names are Poinciana, Peacock Flower, Mexican Bird of Paradise, Dwarf Poinciana, Pride of Barbados, and flamboyan-de-jardin. 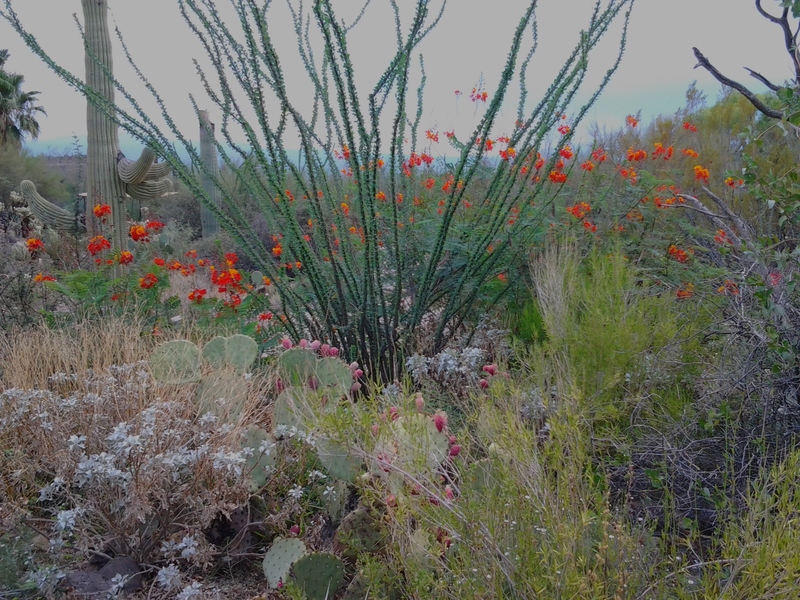 This is especially true for the Red Bird of Paradise bushes, genus Caesalpina, along the roads in Tucson and Phoenix, also common in TX, Mexico and CA. This drought tolerant plant is attractive to bees, butterflies and birds. Are the Bird of Paradise Bean Pods edible? NO, all Bird of Paradise plants and bushes are poisonous if ingested. Bean Pods on the Bird of Paradise bushes and shrubs need to turn brown before you can germinate the seeds. The green bean pods pictured above and below are too young and need more time to dry on the desert plant. Red Bird of Paradise, Caesalpinia pulcherrima, is native to the tropics and subtropics of the Americas and is also the NATIONAL flower of the Caribbean island of Barbados, which is why you may hear it called Pride of Barbados. PLANT AND GROW – How to grow bird of paradise plants, bushes, shrubs from seeds. To germinate the seeds of your bird of paradise perennial plant first step is to score the hard outer coating. I use sandpaper to lightly scrape the seeds then soak them in warm water for 24-48 hours. They will germinate quickly like most seeds in the bean, Legume family, do. To grow your Red Bird of Paradise, plant the soaked seed in peat pots. Cover the seeds lightly with damp vermiculite or a good soil. You should have bird of paradise seedlings in a few days to a week depending on how hard the outer coat of the seeds are. Peat Pots are great and make growing and transplanting your Mexican, Yellow or Red Bird of Paradise seedlings much easier. Start your seeds indoors and when you are ready to plant your Bird of Paradise just put the entire pot in the ground. Roots will penetrate the peat pot and the pot disintegrates enriching the soil. The Red Bird of Paradise is a deciduous (loses its leaves) shrub that thrives in full sun and has bright red and orange flowers that grow on long, thin stalks. The leaves are lacy, ferny-looking. This is an extraordinarily heat resistant, drought tolerant flowering bush that is a perfect addition to any yard. The Red Bird of Paradise is a fairly fast grower, and can get large, so periodic trimming is suggested. See the photo above of large flowering bushes commonly seen along the streets in Tucson and Phoenix Arizona along with Texas and California. Lacy leaves and continually blooming red, orange with a splash of yellow flowers on my Bird of Paradise Arizona shrub. I was worried that the monsoon rains from this week would damage my young Red Bird of Paradise plant. No worries! 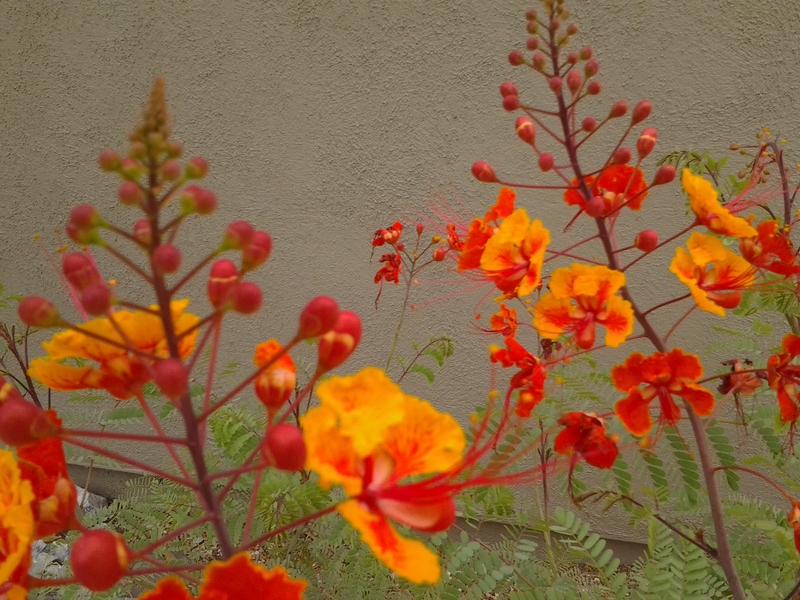 I have new orange, yellow and red flowers decorating our driveway and the hummingbirds love it. The Southwest including California, Arizona, and Texas are cascading with these flowering desert plants and hardy drought tolerant bushes. 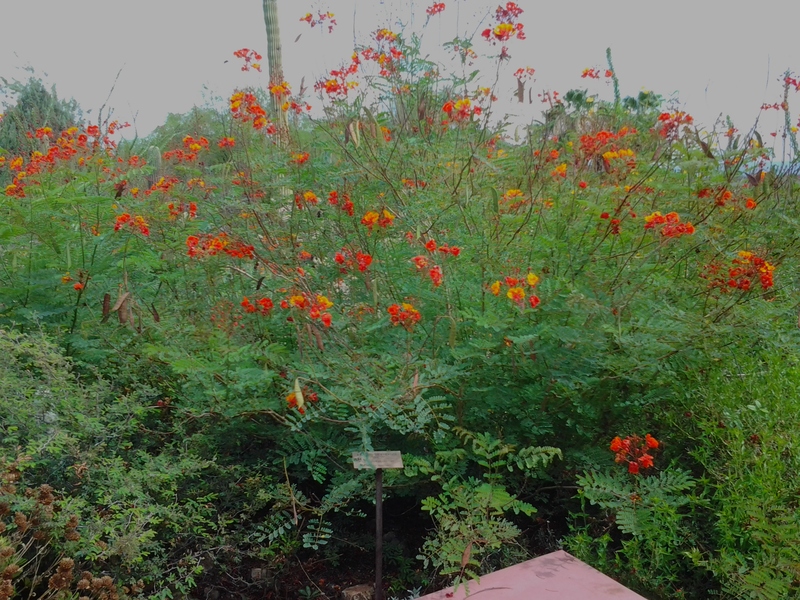 Some my even think the Red Bird of Paradise is a native plant of Arizona. 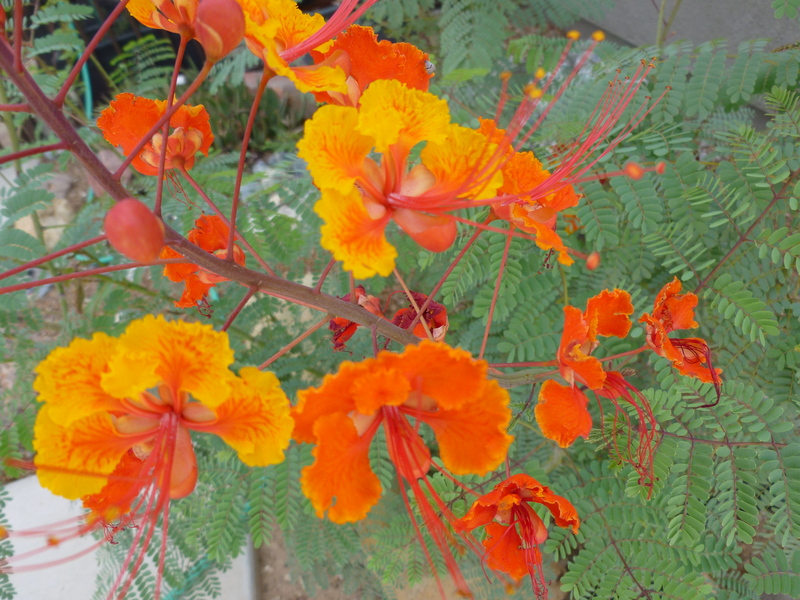 Actually, Red Bird of Paradise, Caesalpinia pulcherrima, is native to the tropics and subtropics of the Americas and is also the NATIONAL flower of the Caribbean island of Barbados, which is why you may hear it called Pride of Barbados. This flowering perennial shrub is one of the easiest desert plants to care for. Red Bird of Paradise is very hardy, drought tolerant once established. (they can have very long taproots) With a little mulch at the base, they come back year after year. 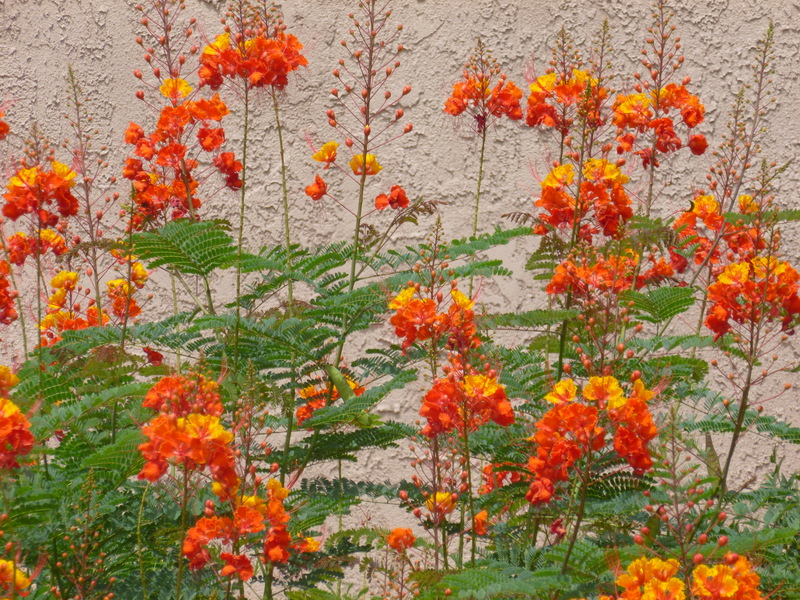 I’ve heard many people in Tucson and Phoenix, Arizona refer to this orange and red desert bush as the Mexican Bird of Paradise (Caesalpinia mexicana). The real Mexican Bird of Paradise has yellow flowers and is larger. The Mexican Bird of Paradise is native to Mexico. The Red Bird of Paradise is a deciduous (loses its leaves) shrub that thrives in full sun and has bright red, yellow and orange flowers that grow on long, thin stalks. The leaves are lacy, ferny-looking. The Red Bird of Paradise is a fairly fast grower, and can get large, so periodic trimming is suggested. A few bean pods are appearing on the Red Bird of Paradise bushes in our yard. I look forward to propagating the seeds later this season as I’ve already located a sunny spot in our xeriscape desert garden to grow more. Red Bird of Paradise plants are a species in the FABACEAE Family, more commonly known as the pea, bean or legume family. To germinate the Red Bird of Paradise seeds, I simply soak the seeds from the bean pods in water for 24 hours. I put them in peat pots, barely cover the seeds. They germinate. Red Bird of Paradise seeds need at least 8 hours of sun, but not direct sun it will be too hot! You can start to give them a little more direct sun after the first leaves appear. Peat Pots are great and make growing and transplanting your Red Bird of Paradise seedlings much easier. Start your seeds indoors and when you are ready to plant your Bird of Paradise just put the entire pot in the ground. Roots will penetrate the peat pot and the pot disintegrates enriching the soil. 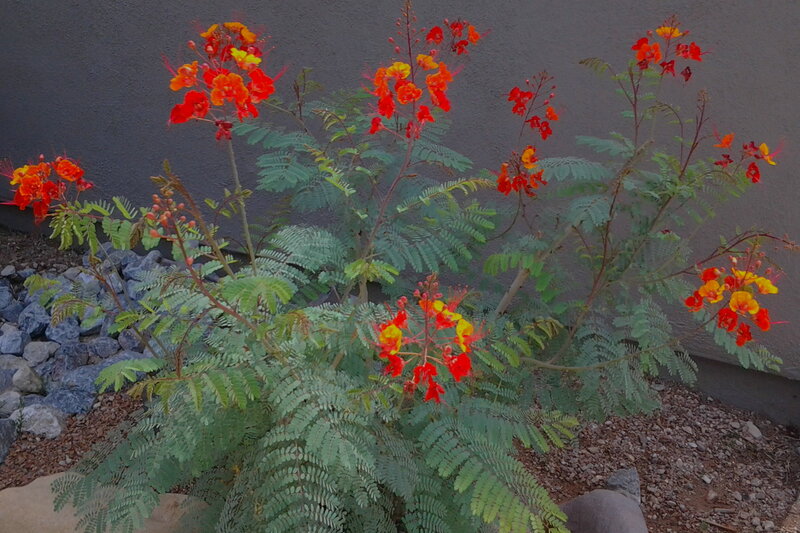 What is the desert bush with Red, Yellow and Orange Flowers? 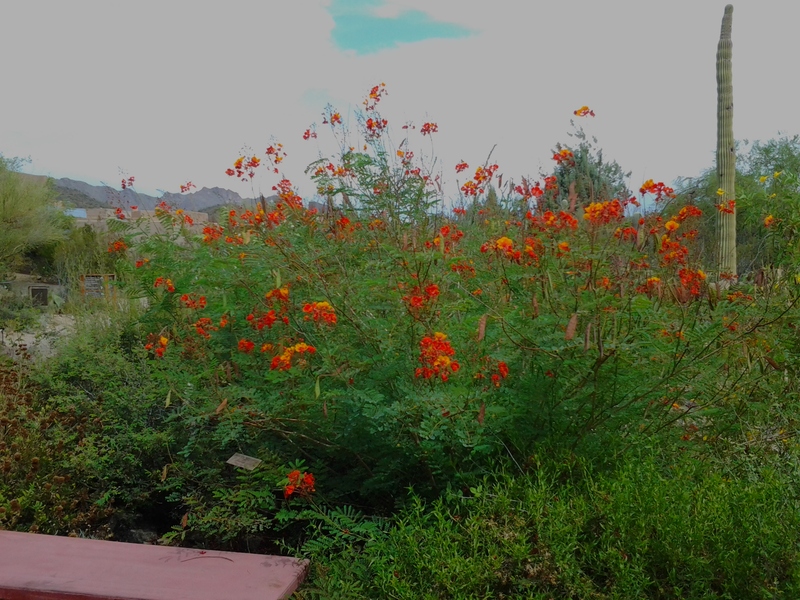 This common Arizona and Texas desert shrub is called the Red Bird of Paradise. The botanical name for Red Bird of Paradise is Caesalpinia pulcherrima, it is a species in the FABACEAE Family, more commonly known as the pea, bean or legume family. This is one of the easiest desert flowering plants to grow and take care of in the Phoenix, Tucson area; along with Texas and California. It is deciduous (loses its leaves seasonally), but will bloom constantly through the summer. The Red Bird of Paradise makes a favorable hedge. 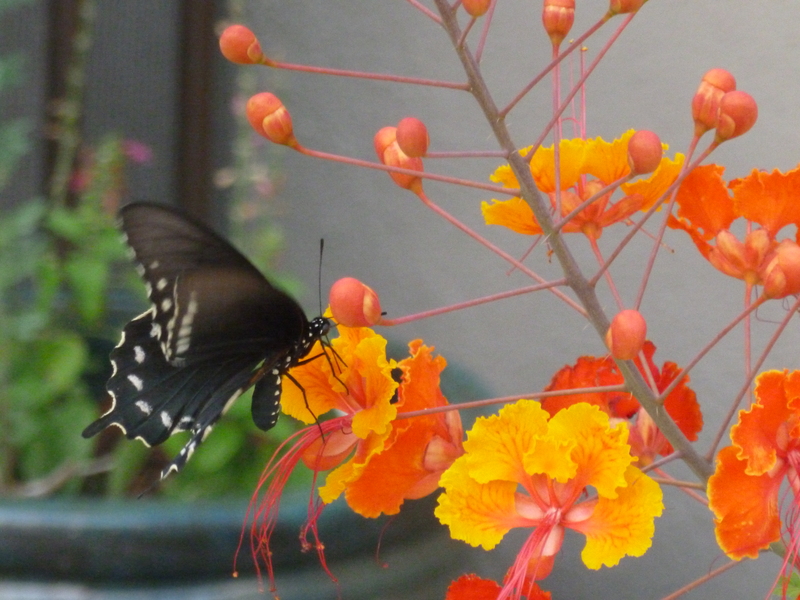 The orange and yellow flowers are one of the best plants to attract butterflies & hummingbirds! The Red Bird of Paradise plant is also the NATIONAL flower of the Caribbean island of Barbados, which is why you may hear it called Pride of Barbados. Please note: when purchasing this plant I have seen it labeled as “Pride of Barbados”. This desert beauty is very hardy and drought resistant once it’s established; they can have a very long tap-root. With a little mulch at the base, your desert bird of paradise will come back year after year. The leaves are delicate lacy, fern-looking. You may see this desert plant’s leaves fold up at night, no worries; it is called Nyctinasty and is completely natural. Bird of Paradise are fairly fast growers, and can get LARGE, so periodic trimming is suggested. The better water drainage you have the healthier this flowering plant will be. Check out our article link: If you are interested in growing your own Bird of Paradise plants from the bean pods. Pictured above is one of our young plants we are watering often until their tap-root is well established. Here are some landscaping ideas to add colors to your garden area. 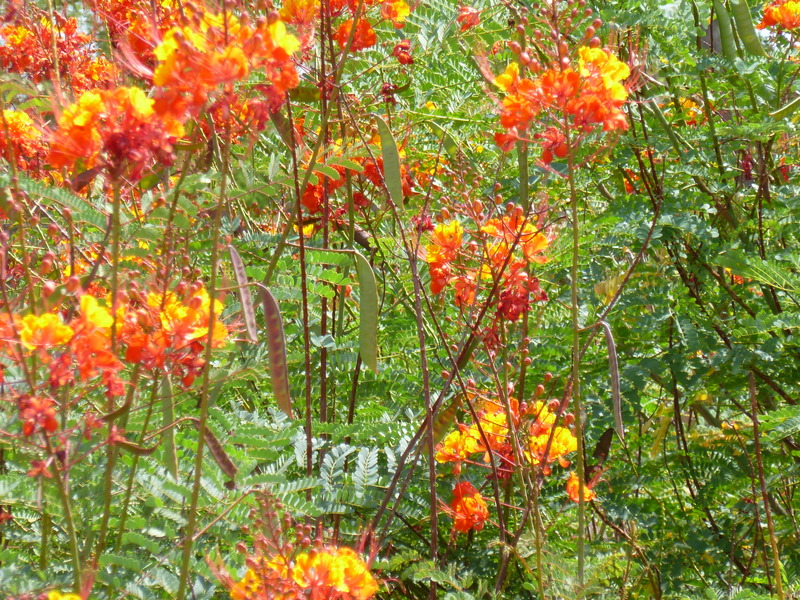 TIDBITS: The Amazon Rainforest Medicine men had some medicinal uses for Red Bird of Paradise, Caesalpinia pulcherrima. Four grams from the root was used to induce abortion in the first trimester of pregnancy. The bean pods and seeds of the Bird of Paradise plant are toxic / poisonous and will cause abdominal symptoms and vomiting.